With only 26 days to go until the first primary votes are cast, campaign season is now in full swing. Candidates have debated countless issues impacting our country, but one issue that has been noticeably absent from the conversation is early education and K-12. Between now and November 8, 2016 we’d like to see a larger focus on policies impacting our nation’s students and families. Americans should know where candidates stand on the following six issues before they cast their votes. 1. Pre-K and Child Care Access and Quality: Early education has received unprecedented attention at the federal level and in a growing number of states over the last few years. The Obama Administration has made access to affordable, quality pre-K and child care key priorities. Federal initiatives like the Race to the Top – Early Learning Challenge, Preschool Development Grants, and Early Head Start – Child Care Partnerships have assisted states and communities in expanding and improving their early education programs and have opened doors for thousands of families. Yet despite this progress, there is still a great deal of work to be done. Only 29 percent of four-year-olds have access to state-funded pre-K and child care costs continue to consume families’ incomes. The Administration has taken important steps, but Congress hasn’t set aside nearly enough funding to ensure that all young children have access to early education. The newly reauthorized Every Student Succeeds Act (ESSA) only included minimal new funding for early learning. Americans on both sides of the aisle have come to realize the promise of early education; polls indicate that improving pre-K and child care access has strong bipartisan support. Yet meaningful talk of early education has been somewhat absent from the 2016 Presidential debates, particularly on the Republican side. We hope the momentum of the last few years continues into this election cycle so that more progress is made to ensure that all young children have access to the early education programs they need to prepare them for kindergarten and beyond. 2. Parental Leave: Currently, only California, New Jersey, and Rhode Island offer paid family leave policies that guarantee workers can take time off to care for a newborn child. But the momentum is growing: there are large majorities of voters of all persuasions who favor paid leave policies and a growing number of cities and states considering legislation in support of paid leave. Last January, President Obama signed a memorandum allowing federal workers to take six weeks of advanced paid sick leave to care for a newborn child or an ill family member. He followed this up in September by signing an executive order that requires federal contractors to offer employees up to seven days of paid sick leave, stating that parents shouldn’t have to choose between losing income or staying home with a sick child. Despite these signs of progress, the United States remains the only industrialized nation that doesn’t offer paid maternity leave. Without policies that provide for parental leave, parents that take the necessary time off to care for a new child often face severe financial consequences such as high amounts of credit cards debt or depletion of savings. The good news is that parental leave policies have become a major discussion topic during the Democratic primary debates. While Hillary Clinton, Bernie Sanders, and Martin O’Malley have put forward slightly different proposals to improve the nation’s parental leave policies, all three are in favor of the expansion of such policies. The Republican presidential candidates, on the other hand, have been all over the map when it comes to parental leave policies. Marco Rubio has called for tax credits for employers who offer paid leave while Jeb Bush and Ted Cruz have stated their opposition to any new federal rules. As the primary season kicks into gear, we hope to see all candidates offer specific plans to provide workers with the parental leave they need to allow them to care for their children without facing the possibility of dire financial consequences. 3. Supports for Dual Language Learners: Around one in 10 American students is a dual language learner (DLL), and the number and percentage of DLLs enrolled in public schools has increased steadily over the last decade. Importantly, there is evidence to suggest that these figures are even higher in the early years of public education — around one-third of all Head Start participants speak a language other than English at home. Given the country’s shifting demographics, it is vital that our education system meets the unique needs of these learners, both as a matter of equity and economics. Since proficiency in both English and a student’s home language produces tremendous academic, social, and cognitive benefits, policymakers should expand opportunities for DLLs to receive a multilingual education. Research consistently suggests that dual immersion is uniquely effective at closing achievement gaps between DLLs and their native English-speaking peers. But, to replicate and scale high-quality dual immersion programs, districts will need a steady pipeline of high-qualified, linguistically-diverse teachers. State and federal agencies must work with institutions of higher education to create new or alternative pathways for bilingual teachers. This election cycle — instead of ignoring DLLs or viewing them as an afterthought — policymakers should recognize DLLs as the tremendous asset that they are and keep their needs at the core of their education policy platform. Combustible immigration debates may make this seem complicated, but candidates should recall that the vast majority of DLLs are native-born U.S. citizens whose right to a high-quality education should be altogether uncontroversial. 4. Open Educational Resources: The availability of high quality, up-to-date educational resources is currently in the spotlight, and the U.S. Department of Education has identified Open Educational Resources (OER) as a key solution to more equitable access for states and districts. Over the past year, a few federal agencies have taken steps to ensure that the educational resources they finance are also openly licensed so that the public can access, update, and repurpose those materials. The Department of Education announced in November that it is considering rules requiring open licenses on materials created under programs funded by competitive grants. Nationally, states such as Washington, Illinois, and New York are also turning to OER to solve the challenge of finding standards-aligned materials that are both high quality and cost effective. From Congress, ESSA also cites open educational resources as a strategy for increasing access to personalized, rigorous learning experiences supported by technology. Even the Organization of Economic Cooperation and Development, an international organization of 34 countries, has recognized the value of OER as a catalyst for innovation in teaching and learning. With recent federal movement toward OER, the 2016 presidential candidates should take a position on whether publicly funded educational resources created through federal grants should be accessible to the public. Though it may make publishing companies (and some folks in the for-profit education space) uncomfortable, as candidates look for cost-effective solutions for improving PreK-12 teaching and learning, they should consider how leveraging OER can be a solution for equitable access to learning resources. 5. PreK-12 Teacher Preparation: While student demographics, and many of the skills needed for students to succeed in college, career, and life have been drastically changing, teacher preparation has largely remained stagnant — leaving many prospective teachers woefully underprepared to succeed in the classroom. Teachers must be trained to analyze data to determine where students are struggling, use technology to help differentiate student learning experiences, support non-native English speakers’ learning trajectories, and help develop students’ “skills for success” as well. Incoming U.S. Secretary of Education John King has made “supporting and lifting up” the teaching profession one of his top three priorities. His call aligns with the Obama Administration’s push for new regulations governing teacher preparation under the Higher Education Act (HEA) — the final version of which will likely release this month. The regulations aim to hold alternative and traditional programs accountable based in part on their graduates’ outcomes. Similarly, ESSA includes a new provision that would allow states to experiment in teacher preparation. Under it, states could choose to set up “teacher preparation academies” that operate outside traditional colleges of education and state regulations and would be held accountable based on their graduates’ outcomes as well. Still, it will be up to states to make good on these policies. And, given the limbo over the Department of Education’s proposed HEA regulations, the open question around ESSA’s, and states’ limited track record in this area, whether states will inch or move swiftly to do either could be greatly influenced by the next Administration. Presidential candidates should commit to improve teaching quality by supporting innovation in the teacher preparation landscape, paired with meaningful accountability. To be sure, it is absolutely critical for candidates to address all aspects of the teacher pipeline — from preparation and recruitment to on-the-job development, compensation, and career advancement — to elevate and modernize the teaching profession. But preparation is where it all begins, and is where the federal government is likely to have the biggest role to play in the coming decade. Candidates should not stay silent on this issue. 6. 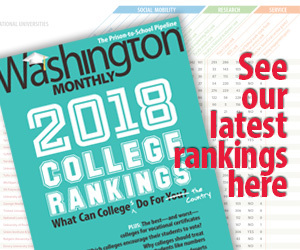 College and career readiness: A focus on preparing all students for college and career in the 21st century has been a hallmark of both the Obama Administration and the U.S. Department of Education. Through both the Department’s No Child Left Behind waivers, as well as initiatives like the President’s High School Redesign initiative (recently redubbed the ‘Next Generation High Schools’ initiative) and the First Lady’s Reach Higher initiative, this Administration has worked to invigorate the conversation around how we can best prepare students to succeed in college and career. Yet Republican and Democratic candidates alike have largely failed to take up the mantle of college and career readiness. In contrast to the last several presidential election cycles, talk on education has focused almost exclusively on college. What little attention candidates have given PreK-12 education has been limited to decrying the Common Core State Standards — a largely symbolic move, rooted more in the rhetoric of federal overreach than in concerns about the content of the standards. Candidates have shared little to nothing about their plans for PreK-12 education broadly, nor college and career readiness specifically. With many of the candidates’ focus on higher education affordability, it makes little sense for them to ignore the very thing that students require to successfully enter college: a college- and career-ready PreK-12 education.